Musician and producer, David Eschmann, had the idea to bring two keyboard improvisers together, a baroque harpsichord player and a jazz pianist, for his concert series "Zwischen den Stühlen" (literally "between chairs"). 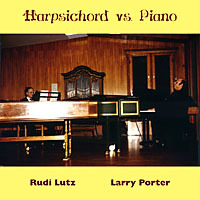 Both Rudi Lutz and Larry Porter were enthusiastic about the project and prepared a repertoire of classical, jazz, Brasilian, and original pieces. This first concert was a success, and the duo went on to work together for several years. This represents the only studio recording they did. Zwei Instrumente - zwei musikalische Welten, Barock und Jazz. Beide Musikanten beinhalten als wichtiges Element das improvisierende Ausführen komponierter Stücke. Auch im harmonischen Aufbau jeweils typischer Stücke finden sich Ähnlichkeiten, denen weltenweite Unterschiede gegenüberstehen; z. B. der Rhythmik, der Melodik, der Phrasierung. Das Konzept von CEMBALO und PIANO entwickelt aus den Gemeinsamkeiten einen Dialog, der die Verschiedenheit von Jazz und Barock nicht verwischt, sondern Beiden ihre typischen Stilmittel beläßt. Larry Porter und Rudolf Lutz schaffen ein lebendiges Zusammenspiel, welches durch seine manchmal geradezu zärtliche Intimität das Publikum zum aktiven Zuhören verleitet. RUDOLF LUTZ, who has been Musical Director of the St Gallen Chamber Ensemble since 1986, leads a busy and varied musical life. He received his musical training initially in Wintherthur and later Zurich and Vienna (organ with Jean-Claude Zehnder and Anton Heiler, piano with Christoph Lieske and conducting with Karl Oesterreicher). He is organist of the Church of St Lawrence in St Gallen and director of the St Gallen Chamber Ensemble and the St Gallen Bach Choir as well as professor of keyboard improvisation, continuo and music theory at the Schola Cantorum Basliensis, the Academy for Music Teachers and Church Music Lucerne and the School of Music and Movement in Zurich. He has toured extensively in Switzerland and abroad and broadcast for Radio DRS (Switzerland) and South West German Radio. Examples for Rudolf Lutz's wide-ranging musical interests include his many concerts, teaching at interpretation seminars, diverse compositions and chamber music performances in addition to playing the dulcimer in the original Appenzell string ensemble "Alpenglühn" and appearances as a jazz musician. Rudolf Lutz has been working with Andrzej Kowalski for many years, both in concertos for violin and organ and as a salon-duo. In 1990 Andrzei Kowalski also appeared as a soloist in the Summer Concert of the St Gallen Chamber Ensemble.